The OWB Weather Box Series is sturdily constructed of painted aluminum and steel and available in surface or flush mounted versions. The series is NEMA 3/3R rated, ensuring protection against accidental contact, moisture and ice. 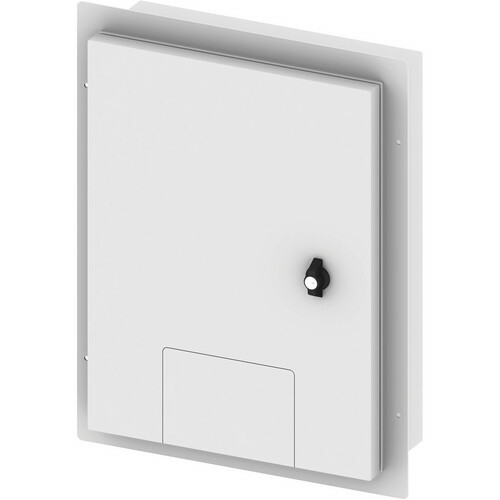 This FSR OWB-X3-FM-PLT Flush Mount Weather Box features a keyed lock. A flip-up cable entry door built into the larger locking cover, allows access to the plugs while the cover is locked, prohibiting unauthorized use. The back box provides a blank gang plate which can be punched by the users to suit specific needs.